Protecting your privacy is important to us. We hope the following statement will help you understand how Gossamer Computer Services. collects, uses and safeguards the personal information you provide to us on our sites. 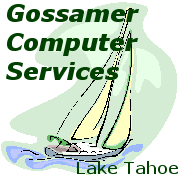 Gossamer Computer Services. only collects personal information that you provide to us voluntarily. Generally we collect your name, email address and/or phone number so that we may contact you. Other contact information provided voluntarily by you may be maintained in our contact database. This may include any additional contact information you provide us including normal business information such as the company you work for and your job title. We also maintain records detailing correspondence between parties which documents your requirements and the subsequent task lists required to provide you with our products and services. Credit card information including the type of card, the card number, expiration date and your purchase details are maintained in a secure location. In addition, our servers generate standard HTTPD logs which are maintained on our servers. This information includes your IP address, date, time, requested URL, referring URL and any browser or robot signatures generated. Gossamer Computer Services. actively searches for website URLs that are of interest to our customers with or without the consent of the website owner. We may also generate and store search engine ranking reports for any URL of interest. Information collected to complete a transaction is only used to complete the transaction and is not used for any other purpose. This information is only available to those parties directly involved in the transaction. Personal information voluntarily provided by you is solely used to market products and services provided by Gossamer Computer Services. Personal information is never shared or sold to a third party for marketing purposes. If you do submit your email or postal addresses online, you may receive periodic mailings from us with information on our services. If you do not wish to receive such mailings, please let us know by contacting us at abuse@tahoestores.net. Information automatically collected by our Web servers are used to generate various reports detailing traffic trends. This non-personally* identifiable information is used solely to market products and services provided by Gossamer Computer Services. and may be used and shared with law enforcement authorities in the case of criminal activities. III. Choices available to consumers. The primary mechanism the consumer of our products or services has to prevent collection of personal data is to not volunteer the information or abstain from using our products or services. Gossamer does not use, nor do we allow our customers to use automated email harvesting and list emailing software. Therefore there is no need to offer opt-in or opt-out options. Simply stated, Gossamer does not employ mailing software that legally requires either opt-in or opt-outs policies. Please report any abuse to abuse@tahoestores.net, or to abuse@m5hosting.com. If you have concerns over other personal information collected by Gossamer Computer Services. without your knowledge or consent; please direct your concerns as described in our Consumer Inquiries section found below. These are the only mechanisms available for the consumer to address their concerns with Gossamer Computer Services' use of personal information for marketing purposes, to confirm that Gossamer Computer Services has received your complaint, or to review the choices you have made (if any) and to make changes to your choices. Please allow 7-14 business days for our response. All credit card transactions use the industry standard Secure Sockets Layer (SSL) protocol that encrypts personal information being transferred over the Internet. Consumer information is under the strict control of the Officers of Gossamer Computer Services to safeguard against unauthorized employee or subcontractor access to information as well as inappropriate disclosure of consumer information by an employee or subcontractor. * Your use of a static IP address may lead to identification of personal data contained in the WHOIS database or to your local ISP in the case of a dynamic IP address.